What did Walter Adams, former Mayor of Bundaberg, Member of the Legislative Assembly of Queensland, respected and revered member of society, think when his son announced his intention to marry the daughter of a convicted criminal? Admittedly, it was 16 years since Patrick Mackinlay’s release from prison but the sensational court case had been front page news. Surely Walter would have known about it. Walter’s son, James, was the black sheep of the family so perhaps his father’s opinion didn’t matter very much to him. He was of full age and didn’t need his father’s permission to marry. The relationship between Walter and James was obviously a rocky one. In 1890, Walter wrote to his daughter about her brother, “I told him a few wholesome (sic) truths for which I shall not beg his pardon”. Walter and James seem to have been reconciled shortly before Walter’s death in 1892 when Walter amended his will to include James as an executor and trustee (Connor, 2012). James’ marriage was ill-fated. 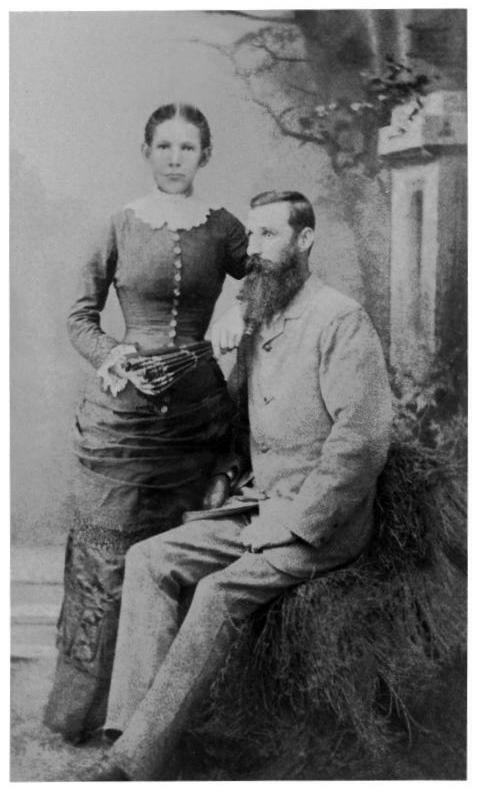 James Walter Adams married Catherine Beatrice Mackinlay in Bundaberg in 1887 but by 1900 the couple had separated. They never formally divorced. Divorce after all was much less common, harder to obtain, and they were both Roman Catholic. James seems to have lived a lonely, semi-nomadic life in his remaining years with a horse named Gladys his final companion (Connor, 2012). Catherine’s sisters had moved to Western Australia in the early 1900s because of a mining boom. Catherine (or Sissy as she was known to the Mackinlays) and her two youngest children followed. In 1908, Catherine married James Richard Forrester in Greenough, making herself a criminal by committing bigamy. In those days of limited communication, Western Australia was a long way from Queensland. Catherine was unlikely to run into anyone who knew that her first husband was still alive. Of course her sisters knew but they doubtless thought Catherine better off well away from a man who family oral history says drank a lot and beat her. 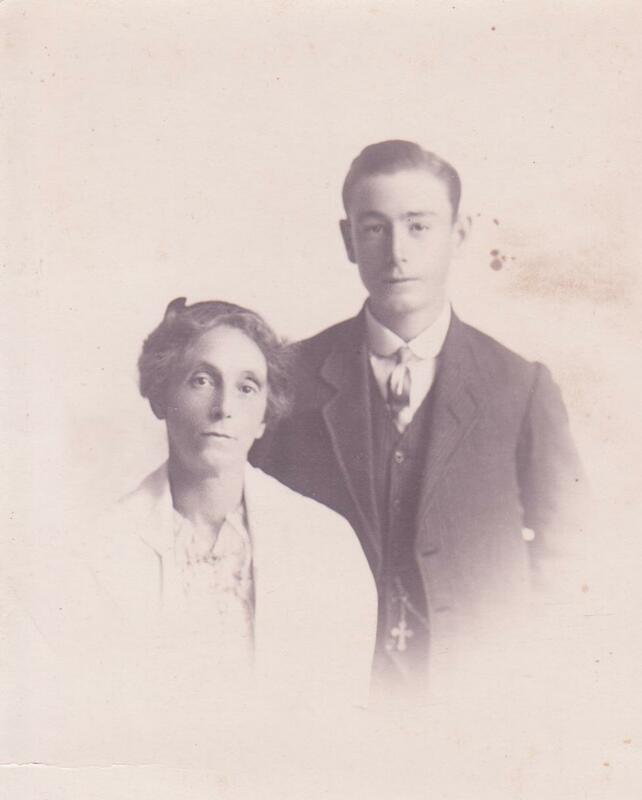 Catherine in later years with her son, Ossie. Connor, R.L. and Connor, J.K. (2012). Bundaberg’s Beginnings: the Endeavours of Its Very Early Pioneers. Richard Laurence Connor: Brisbane. Ned Kelly’s family used to come into his shop. Two of his apprentices (Barry and Roberts) betrayed him and went on to start their own grocery store. He lost everything in a fire on Christmas Eve. These were some of the family legends told about my great-great-grandfather, Patrick Mackinlay. Like many family legends, they turned out to have a grain of truth but the facts had altered over the years – probably accidentally – but it’s possible that there was a deliberate attempt to hide what turned out to be a skeleton in the closet. Patrick Mackinlay was born in County Antrim in Ireland in about 1836, the son of Patrick Mackinlay and Catherine Connolly. He arrived in Australia in 1857 on board the “Commodore Perry” and was listed as a labourer. His brother Denis arrived in 1860 aboard the “Persian”. In 1861 “Mackinlay Brothers” were trading in Erskine Street, Sydney and advertised a couple of times in the newspaper – once they were looking for a second-hand cart and harness, and a revolver, and the other time for one ton of beeswax. Patrick married Elizabeth (Eliza) Mary Theresa Walsh (daughter of Michael Walsh and Mary Ann Fennell) at Bandon Lachlan in 1863 at which time he listed his usual place of residence as Forbes and his occupation as storekeeper. In 1866 the couple was living in Bathurst where both Patrick and Eliza owned property but by 1868 they were living in Mary Street, Brisbane and “Mackinlay Brothers”, grocers were trading in Edward Street. It seems that Patrick was running the Brisbane store while Denis ran the Sydney stores (there was one in King St as well) and oversaw their operations in north Queensland. 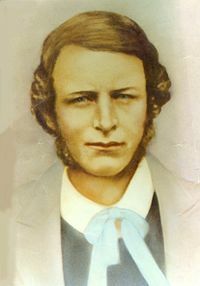 A simple search of Australian history showed that Australia’s most famous bushranger being a customer of Patrick Mackinlay’s was not likely, since the Mackinlays had probably left Victoria within a few years of Ned Kelly’s birth in 1855. Ben Hall, arguably Australia’s second most famous bushranger, did however live in the Forbes area and was at large in the early 1860s so this may be a case where the story has been changed as it passed through the family by word of mouth. The names of Thomas Joseph Barry and Samuel Roberts are familiar to anyone who has lived in Brisbane for a long time. In 1898 Barry and Roberts “opened a small shop in George Street where they soon startled the trade and the public, by the cheapness of their goods”. Their business model did indeed horrify their competitors – “old-fashioned retail merchants” (The North Queensland Register, May 15, 1905) – and may have impacted the business of Mackinlay Brothers but there is no evidence that they were apprentices to the Mackinlays and there is much more to the story of Mackinlay Brothers’ financial demise! There were a few fires in the early days of Brisbane when most of the buildings were made of wood. The “great fire” of December 1, 1864 destroyed buildings on Queen Street between George and Albert Streets and cottages between Queen and Elizabeth Streets but in 1864 Patrick was probably living in Forbes or Bathurst. Another fire occurred in April 1870 in Elizabeth Street and it is mentioned in the Brisbane Courier (16 April) that flames in the roof of the cottage occupied by Mrs Mackinlay were extinguished but that the damage to the roof was minor. Why was Mrs Mackinlay listed as the resident? Because her husband was in jail in Sydney. It is thanks to the National Library of Australia’s Trove website (http://trove.nla.gov.au) that I was able to find out about the circumstances surrounding this fire and another which affected the Mackinlays. When I entered “Patrick Mackinlay” into the search field, the first newspaper article which popped up had the headline “Conspiracy to Defraud” and there followed a number of articles about Insolvency Courts. This is the short version of the story. As mentioned Patrick and Denis Mackinlay were trading as grocers in Sydney and Brisbane. They also had some sort of operation in northern Queensland with stores held on Sweer’s Island in the Gulf of Carpentaria. In June 1869 they were experiencing financial difficulties and declared insolvent (incidentally some thirty years before “Barry and Roberts” was established) but were still in business and attempting to meet the demands of their creditors. Somewhere around July they bought goods from two companies and said that they would be shipping these goods to Sweer’s Island with the intention of selling them in north Queensland. The insured goods were loaded onto a ship called the “Snowbird” which the Mackinlays had recently purchased, and at this point, different people’s versions of the story begin to differ. According to the prosecution at their Criminal Court trial, most of the goods were secretly removed and a large quantity of gunpowder was loaded. The ship left port from Sydney heading north, Patrick Mackinlay came on board in Brisbane and on the next leg of the journey a fire broke out which ended in an explosion and the loss of the ship, although all on board made it safely to Townsville. The prosecution alleged that the Mackinlays and others working with them deliberately caused the explosion with the aim of claiming the insurance money meanwhile raising money by selling the goods which they claimed had been destroyed but which had in fact been “rebranded” and sold in Melbourne and New Zealand. 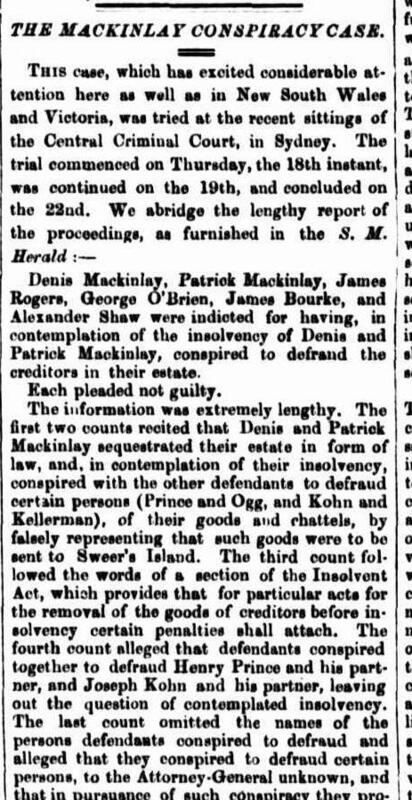 The lawyers for the Mackinlays maintained that their clients were not intending to defraud and that they were merely attempting to realise income from the sale of the goods in order to pay their creditors, those goods being destined for Sweer’s Island had been a misunderstanding or they had changed their minds about what to do with them, and the fire was a terrible accident. The jury obviously believed the prosecution and all the accused but one (James Bourke) were convicted and sentenced. While acquitted on charges of conspiracy and fraud James Bourke went on to stand trial for receiving stolen goods. 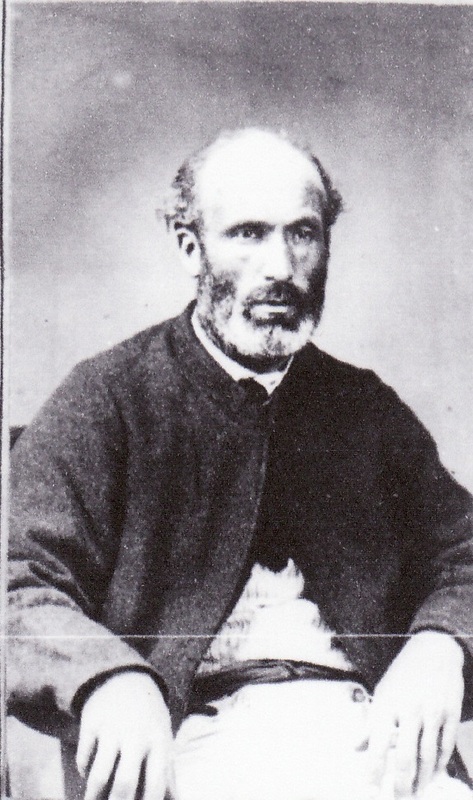 Denis Mackinlay (1838-? ), taken on his release from jail. My great-great-grandfather’s defence lawyer claimed that Patrick was only a bit player and since he was living in Brisbane while all the operation was taking place in Sydney, had no real knowledge of what was going on. He did receive a shorter sentence than the other men involved and Denis’ insolvency trial was certainly much more complicated. The insolvency cases went on for several years, including once Patrick was out of prison but he went into business again and any rift with his brother must have eventually been mended because in March 1879 Patrick Mackinlay, Denis Mackinlay and Mary Ann Walsh (Patrick’s sister-in-law) who had been trading in co-partnership in Brisbane, Cairns, Torres Strait and Smithfield were declared insolvent. 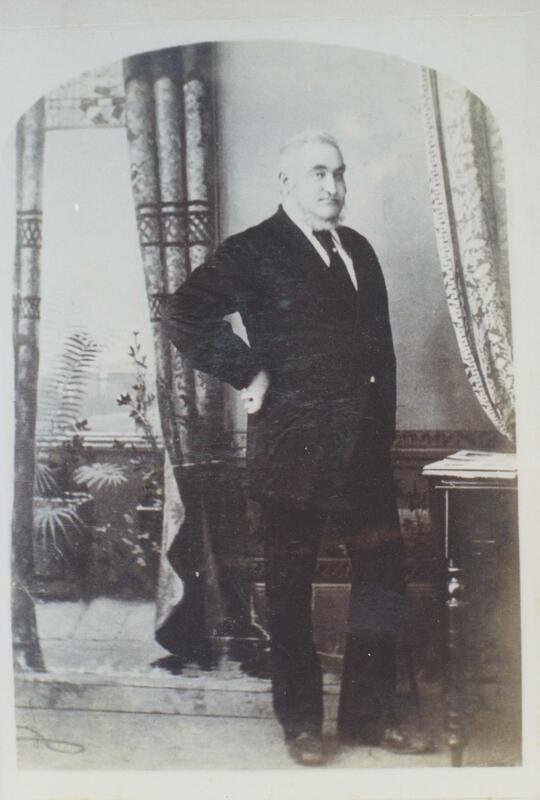 A short six months later Patrick announced in the newspaper that he had purchased a grocery business (the Brisbane Tea Warehouse) from one Charles McLeod. In 1883 insolvency procedures were again (or still) occurring, and in 1885 Patrick was advertising for all parties owing him money to please pay up! Patrick Mackinlay appears in the Brisbane Post Office Directories up until 1908 at a series of addresses in inner Brisbane. In 1888 he is listed as a grocer’s assistant, in 1903 as a commissioner’s agent. From 1909 he was living in Merton St, Woolloongabba, which is where his funeral left from in 1916. Was he a crook, a naïve victim of his brother’s scheming or just a businessman who made some bad decisions? Ancestry.com. Victoria, Australia, Assisted and Unassisted Passenger Lists, 1839–1923 [database on-line]. Original data from Victoria. Inward Overseas Passenger Lists (British Ports). Microfiche VPRS 7666, copy of VRPS 947. Public Record Office Victoria, North Melbourne, Victoria. This article first appeared in the February 2014 edition of “Australian Family Tree Connections”.